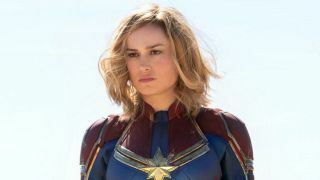 UPDATE: The Captain Marvel trailer has arrived. Watch it in the link now. We may have jumped the gun a little bit last time in the lead-up to the first Captain Marvel reveal, but I can say with confidence that we’re absolutely getting the Captain Marvel trailer today, September 18. No take backs. In fact, our first look at footage featuring Brie Larson as Carol Danvers is coming our way very, very soon, so it might be time to start making plans for a long lunch or to get into work a little later than normal. Ahem. As confirmed on its Twitter account, US talk show Good Morning America will have Brie Larson on as a guest and, while she may be there to shoot the breeze, she’s also got another important job: to introduce the Captain Marvel trailer. Now for the icky bit. Timezones. Ugh. Good Morning America starts at 7am EST and ends two hours later at 9am EST. As of right now, we don’t have a schedule for when Brie Larson is meant to be showing up, but if watching morning TV while pretending to work has taught me anything (don’t tell my editors), you’re going to want to push it back as near to the end of the show as possible so you get as many eyes on the product. If that’s the case, expect the Captain Marvel trailer to hit just before 9am EST. That’s 7am Pacific and, if you’re in the UK, 2pm. If you’re in the US, you can fire up the ABC Network or, if you’re elsewhere (or in the States and want to watch it again and again), expect both the Captain Marvel Twitter account and the Marvel Studios Twitter account to push it live at exactly 9am EST. And of course we’ll be covering it on GamesRadar asap as well! Now, don’t mind me, I’m getting prepared. Not long to go now. While you wait, be sure to check out the best upcoming movies on the way for the next few months and beyond.